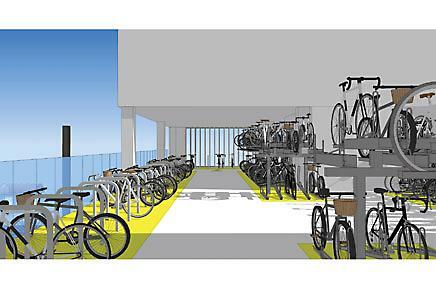 Cambridge looks set to get the UK biggest multi-storey bike park, with space for almost 3,000 bikes, after the city council’s planning committee on Tuesday approved plans for the development of the site at the railway station. The bike park is part of the city council’s £850 million project to improve the area around Cambridge station and is expected to open in December 2014. The £2.5 million project includes a 230-bedroom hotel on the site of the current British Transport Police building, which will be knocked down. Speaking to Cambridge News, Mike Derbyshire of development company Brookgate which is running the project, described the new park as the rail industry’s “flagship” cycle facility and said it was “entirely appropriate” that it should be built in Cambridge. 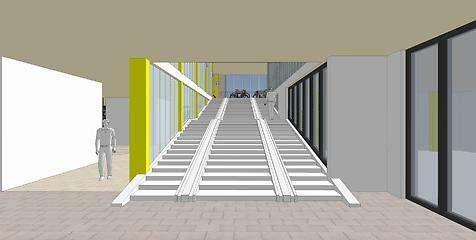 Thee will be ramps alongside stairs so riders can push their bikes to parking spaces and five percent of the spaces will be in a secure area, for which a fee will be charged. While critical of some aspects of the planned facility, Jim Chisholm, from Cambridge Cycling Campaign, said it was desperately needed and would help to reduce congestion on the roads. He said: “The current scheme isn’t perfect perfect. It doesn’t have cycleable ramps, it doesn’t face the station, there is currently no direct connection to the overbridge, and conflicts between users may occur at the entrance. While this is a huge project in UK terms, it will be dwarfed by the recently-announced bike park to be built in Utrecht, in the Netherlands, with 12,500 bike parking spaces.